﻿Palm Sunday: Calendar, History, Tweets, Facts, Quotes & Activities. Palm Sunday commemorates Jesus Christ's last, triumphant entry into Jerusalem before his crucifixion. 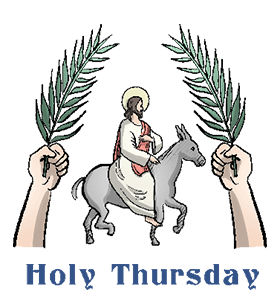 According to the Gospels, as Jesus entered Jerusalem on a donkey, the crowds greeted him by waving and laying palm branches in his path. Today, palms are still used during Palm Sunday ceremony. The palms are blessed during the ceremony and then collected and burned into ash for the following year's Ash Wednesday celebration. Palm Sunday is celebrated annually on the Sunday before Easter. Crowds of people welcomed Jesus to Jerusalem, throwing their cloaks on his path and waving palm branches (John 12:19, Mark 11:1-11, Matthew 21:1-11). It was similar to the reception that Caesar, the emperor of Rome, would receive. Caesar was considered God among Romans, and this event not only underscored Jesus' divinity and kingship, it was an act of treason in Roman society. The colt that Jesus rode on into Jerusalem (Luke 19:28-44) was said to fulfill prophecy from the Old Testament about the Messiah, the savior of Israel. The Old Testament scripture he fulfilled is Zechariah 9:9: "Rejoice greatly, O daughter of Zion! Shout aloud, O daughter of Jerusalem! Behold, your king is coming to you; righteous and having salvation is he, humble and mounted on a donkey, on a colt, the foal of a donkey." Palm Sunday is celebrated in virtually every Christian church. It marks Jesus' final entry into Jerusalem before he was persecuted, crucified, and resurrected. The observation occurs toward the end of Lent, a 40-day period of fasting and preparation meant to create reflection on Christ's suffering. Palm Sunday is traditionally the beginning of Holy Week, which includes Holy Thursday and Good Friday services, as well as Easter Vigil services on Saturday and Easter Sunday. Many parishes provide palms as part of Mass on this day. The palms are typically weaved into crosses and other religious symbols. Our procession today is meant, then, to be an image of something deeper, to reflect the fact that, together with Jesus, we are setting out on pilgrimage along the high road that leads to the living God. This is the ascent that matters. This is the journey which Jesus invites us to make. - Pope Benedict XVI, April 2011 Palm Sunday Service. Go to a Palm Sunday church service and get palm branches. Offer somebody a palm as an act of reconciliation or forgiveness. It is a common tradition among many Italian Catholics. Watch the TV series Rome . It portrays the Roman Empire's civil religion - the worship of Caesar. Create a work of art with palm leaves. Some American and Latin Roman Catholics weave the palm leaves into crosses or other symbols.